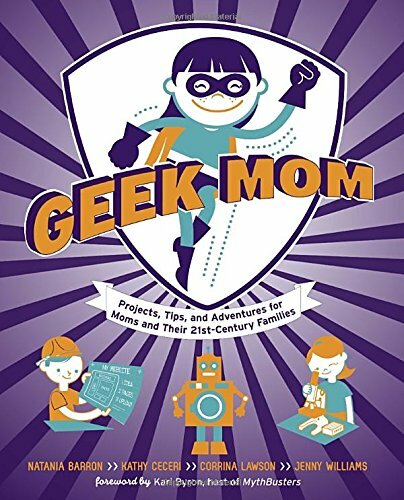 It’s fast becoming a geek world out there, and all moms need to show off their tech smarts and superhero-like skills in order to keep their savvy kids entertained and engaged.Geek Mom: Projects, Tips, and Adventures for Moms and Their 21st-Century Families explores the many fun and interesting ways that digital-age parents and kids can get their geek on together. Imaginative ideas for all ages and budgets include thrifty Halloween costumes, homemade lava lamps, hobbit feasts, and magical role-playing games. There are even projects for moms to try when they have a few precious moments alone. With six sections spanning everything from home-science experiments to superheroes, this comprehensive handbook from the editors of Wired.com’s popular GeekMom blog is packed with ideas guaranteed to inspire a love of learning and discovery. Along the way, parents will also find important tips on topics such as determining safe online communities for children, organizing a home learning center, and encouraging girls to love science. Being geeky is all about exploring the world with endless curiosity. Geek Mom is your invitation to introducing the same sense of wonder and imagination to the next generation. "Geek Mom is ADORABLE. It's filled with fantasy and science-y games, projects, and activities for parents, kids, and anyone who wants to feel like a kid again! I can't wait to share this with my son." "Make a monster! Throw a hobbit feast! Learn to LARP! Geek Mom shows you how to share fun projects with the next gen of artists, scientists, and tinkerers!" Natania Barron, Kathy Ceceri, Corrina Lawson, and Jenny Williams are the cofounders and senior editors of Wired.com’sGeekMom blog. The only female contributors to the GeekDad blog, they joined together to create a website where women could share some of the special aspects of being geeky and being moms. Today the GeekMom blog’s loyal followers—men and women, parents and others—flock to hear them talk at conventions around the country. In addition to its editors, theGeekMom blog has more than twenty regular contributors and many more occasional writers from across the United States, Canada, and Europe. This is the first joint book project for the four coauthors.